Hard to believe it was so long ago but it was in 2010 I first heard mention of this book through a review by Sarah @ Reading from the Past and added it to my TBR. It's taken the Canadian Book Challenge to spur me into finally reading it. 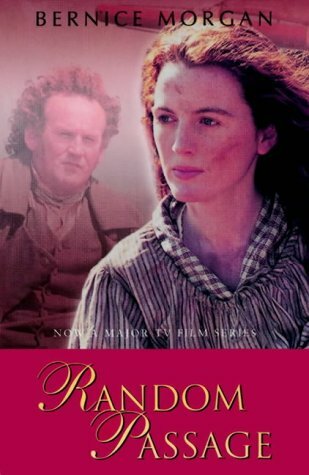 Random Passage is a novel about the early settlers in one of Newfoundland's isolated coastal areas and the fictional Cape Random is based on a real community in Bonavista Bay where the author's mother grew up. The story begins in England in the 1820s.... when son Ned is accused of stealing the Andrews family is forced to leave England in a hurry and take passage on a ship to the New World. At the end of the journey they find themselves put ashore onto a cold and barren land occupied only by a taciturn storekeeper and one other family. For seventeen-year-old Lavinia it seems a fate worse than death and to ease her loneliness she soon begins a journal in which she records the small community's daily lives. I've read many pioneering stories but this has to be the most harrowing and one can only wonder at the incredible endurance and will to survive these people must have had. Close to death from starvation every freezing winter, struggling to build homes and grow food and dependent on the sea for the fish that could be exchanged for the supplies they needed. Disappointed! Instead of returning to Cape Random the sequel begins in present day Ottawa (1980s) where Andrews descendant, Lav works for the Fisheries Dept. After being transferred to Newfoundland she discovers the first Lavinia's journal and begins to learn of the family she has never known. Additions were made to the journal after Lavinia's death by Mary Bundle, a young woman who arrived at Cape Random soon after the Andrews. The middle part of the book tells Mary's early story and through her eyes the same events Lavinia wrote about are told from a different perspective. Interesting but sometimes repetitive. I didn't enjoy Waiting for Time as much as Random Passage. It seems that originally it was intended to be one book and I would have preferred one chunky generational saga. The continuity of the family lines was lost in the sequel and even with the help of a family tree, which I had to keep referring to, I found it difficult to figure out who was who. Overall, I did enjoy it, especially the history as I know very little about Newfoundland, and like all good historical fiction should, it has left me wanting to explore further. I'm disappointed to see they used movie stills for the cover. I'd enjoyed the movie (mini-series) mind you, and recommend that if you're ever in Newfoundland go visit the set where it was filmed, but still I find it so cheesy when they make that the new book cover. I agree the covers are not at all attractive. And maybe one day I might get to visit Newfoundland......it's a nice dream! Glad to read your review! I agree with you about Waiting for Time. I would have been happier without the modern-day segments. I think the way it was structured interrupted the flow which was a shame. I might have liked the contemporary part better if it had been in sequence with the older generations.